First off, let's deal with the body work that comes out of the plastic after finishing. This thing comes with amazing details, and when finished well, they stand out so well, it's hard to tell this apart from pictures of the full size Ford. We stole the 4-Leaf spring chassis from the Yellow Blazer, and stuffed it under here for some testing and body mount development, which didn't take long. We will for SURE switch it for the proper Bronco radius arm front end and 44/9in axle set we have developed specifically for this truck, but that's another post. For now, we've added the mount set to our shapeways store (LINK HERE) and did a little video to show off how it works on this body. That's a beauty. Well done. There's some stuff missing from this kit: front engine bay/fenders/floor/rear fenders. 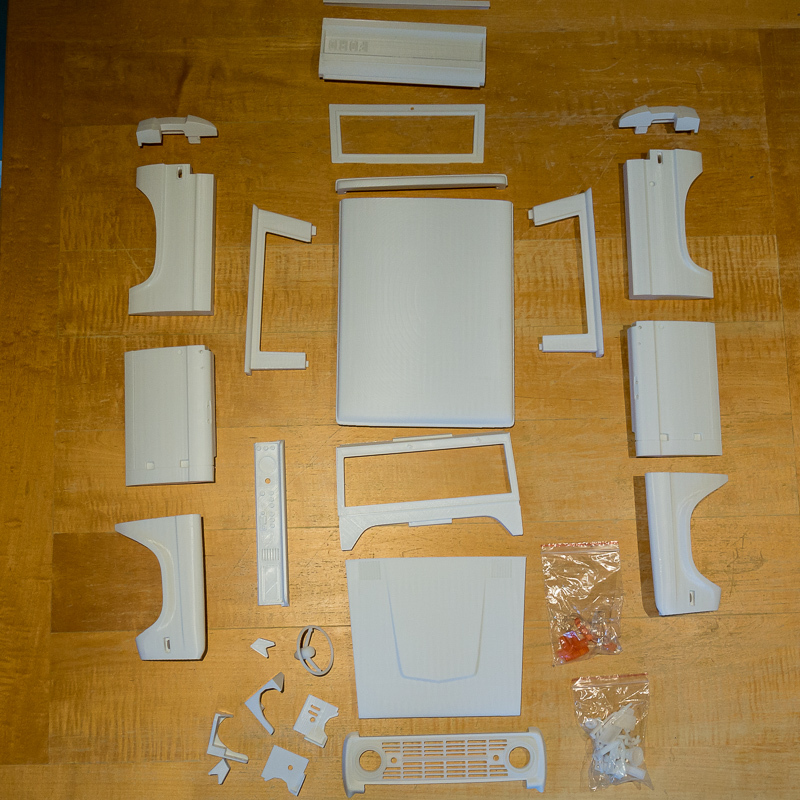 All this will be fixed in short order as a new bunch of printed parts (that we will print here). Up front, we stuck on the GCM V8 from Shapeways, which is actually a Ford reproduction, so that's a simple match! I'll have to make up the proper stuff in the nose. It needs to have the cowl/air intake put in front of the windscreen, as well as the steel sheet inner fenders, and then the rad support top part. All this I'll draft up and then add to the CHASSIS so the body can come on and off as I desire, and the under-parts won't change at all. That's going to make wiring really easy, and I can just make a plug for the body mounted lights, the rest will be able to stay with the running chassis forever. The dash is currently mounted to the body, but I may move it to the firewall, so the steering wheel servo or lighting wires can stay on the chassis as well. It may make it easier to do if the driver stays in the seat with his moving steering wheel as one piece and have the body separate. There's a nice inner side wall already on the body, as part of the original body print. There's most of a door panel there, and the basics of the rear inner fender wall under the back window. That's a good start, but the best news is that if the body has to come off straight up, then this sort of a construction will work great, and it will work to have the floor locked on to the chassis. Lots more to do, but for now, let's take tons of great pictures! A work of art. JS Scale knows how to do it all. This really makes me like Broncos. And hate them too because it's perfection. very cool rig. I sure do love those early bronco's. I checked there website and don't see it on there. is this an early preproduction one?